The best malls in Bahrain have a lot in store for residents and tourists alike. Each of these malls brings together a variety of entertainment venues, fine dining, and shopping. Moreover, they are spread out across the kingdom, allowing locals, expats, and tourists the chance to see as much of the country as possible. As a vibrant touristic hub, the Kingdom of Bahrain is now home to many luxurious destinations. From five-star hotels and resorts to mega-malls and multi-use developments. Here are the 9 best malls in Bahrain that you need to visit. 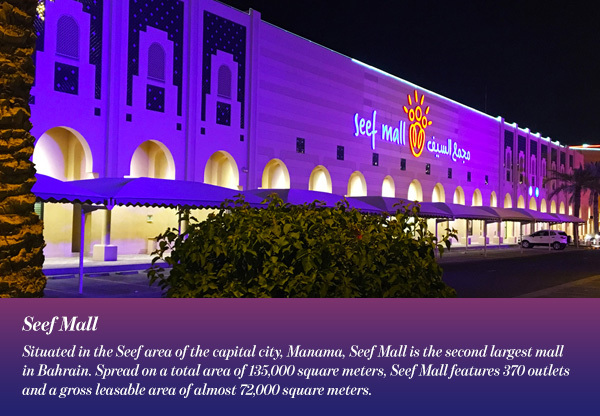 Situated in the Seef area of the capital city, Manama, Seef Mall is the second largest mall in Bahrain. Spread on a total area of 135,000 square meters, Seef Mall features 370 outlets and a gross leasable area of almost 72,000 square meters. Furthermore, it includes 55 restaurants, food stalls, and cafes. A family-oriented destination, Seef Mall offers a multitude of entertainment venues for every family’s needs. The mall’s indoor theme park, Magic Island, is a 4,300 square meter key attraction. Moreover, the mall boasts one of the largest cinema multiplexes in the Middle East with a six-screen Cineplex and a ten-screen Megaplex. Seef Mall is also directly connected to Fraser Suites, which features 90 studio, one-, and two-bedroom fully furnished serviced apartments. Located in Sanabis, Manama, The Bahrain Mall covers an area of 70,000 square meters. Attracting about 480,000 visitors per month, it is definitely one of the best malls in Bahrain. With 1600 parking spaces, a large supermarket, and a variety of stores spread over two floors, Bahrain Mall is a reliable destination for residents. 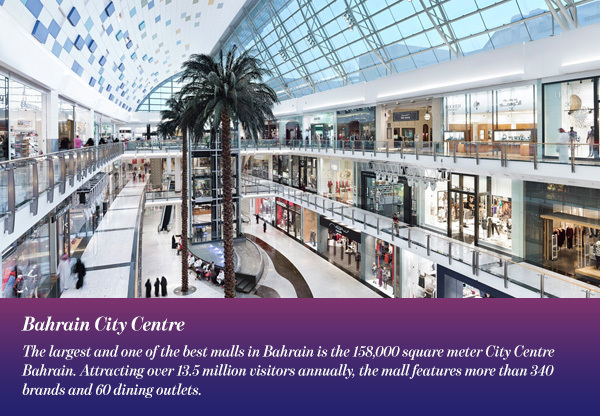 The largest and one of the best malls in Bahrain is the 158,000 square meters City Centre Bahrain. Attracting over 13.5 million visitors annually, the mall features more than 340 brands and 60 dining outlets. City Centre Bahrain is also home to Wahooo! Waterpark, the Middle East’s first and largest indoor-outdoor waterpark, a 20-screen Cineco Cinema, Yalla! Bowling Lanes & Lounge, and a Magic Planet. Moreover, the mall is adjoined by the 5-star Westin Hotel City Centre Bahrain and Le Meridien Hotel City Centre Bahrain. 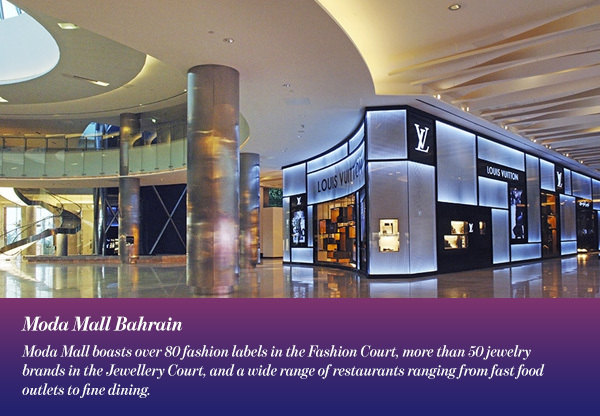 Located on Sheikh Khalifa Bin Salman road in Manama, the mall opened in 2008. It has since then held the spot as the largest shopping, leisure and entertainment destination in Bahrain. Open to the public on October 29, 2017, The Avenues Mall Bahrain is a waterfront shopping centre located along Bahrain Bay in Manama. Inspired by The Avenues – Kuwait, it is the first shopping and leisure destination of its kind in the Kingdom of Bahrain. While the mall is only one floor, it features almost 40,000 square meters of leasing space with 130 stores. 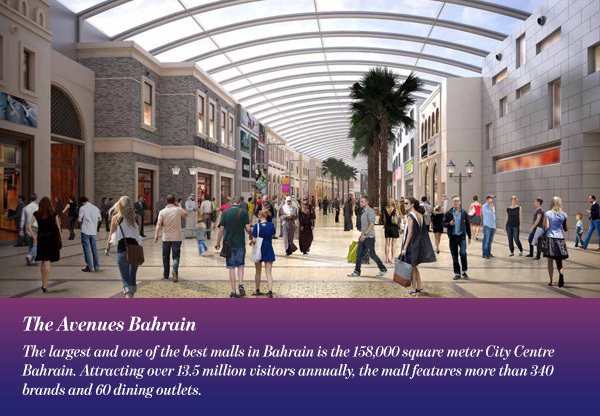 Moreover, 50% of the mall’s space is allocated for restaurants and cafes, which will overlook Bahrain Bay. The Avenues Mall Bahrain also includes a special play hall and 12 cinemas. As well as public parks and gardens, walkways, and parking spaces for 1400 vehicles. Phase Two of the project will add 30,000 square meters in leasing space, new districts, and a hotel with 210 rooms. The Avenues Mall Bahrain is also set to welcome a water taxi service to transport passengers to and from the development. Established in the Juffair area of Manama, Juffair Mall opened on 15 December 2015. 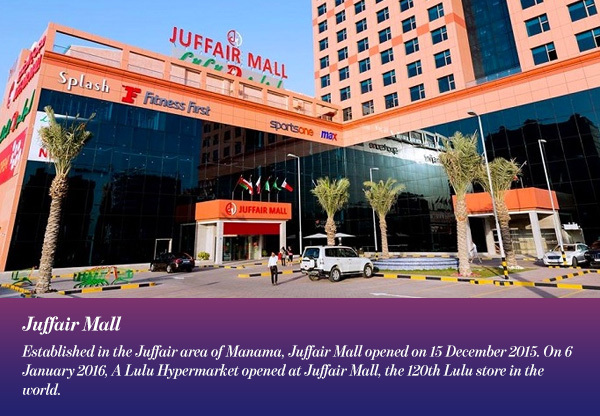 On 6 January 2016, A Lulu Hypermarket opened at Juffair Mall, the 120th Lulu store in the world. At the mall, visitors have access to shops, a spacious food court, and cinemas spread across the mall’s five floors. Juffair Mall is a cozy one-stop destination for families, residents, and tourists. This cozy and authentic venue is definitely one of the best malls in Bahrain. Positioned in Manama’s Bahrain World Trade Center, Moda Mall features the largest portfolio of luxury brands in the Kingdom of Bahrain under one roof. Moda Mall boasts over 80 fashion labels in the Fashion Court, more than 50 jewellery brands in the Jewellery Court, and a wide range of restaurants ranging from fast food outlets to fine dining. The Courts make up two beautiful glass domes inside the mall, allowing natural light to shine through. Moreover, the mall includes a fitness centre, beauty salon, banks, a convenience store, and a business centre. All these features are spread across an area of approximately 16,500 square meters. Furthermore, Moda Mall’s parking area, which is shared with Bahrain World Trade Center, can accommodate up to 1,700 vehicles. Dragon City is the largest wholesale and retail-trading centre in the Kingdom of Bahrain. With over 787 commercial units, it is the first of its kind in the kingdom. 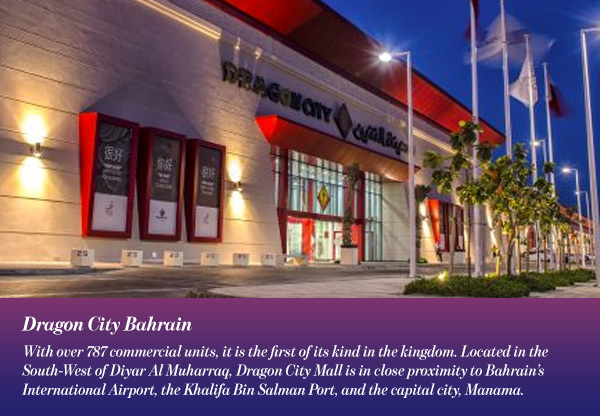 Located in the South-West of Diyar Al Muharraq, Dragon City Mall is in close proximity to Bahrain’s International Airport, the Khalifa Bin Salman Port, and the capital city, Manama. Infused with Chinese architecture and cultural features, Dragon City provides high-quality Chinese products to local consumers, trade customers, and tourists. The mall includes a variety of stores ranging from electronics and hardware to home furniture and fashion. It also features a food court and cafes. Saar Mall opened its doors to the public in 2013. 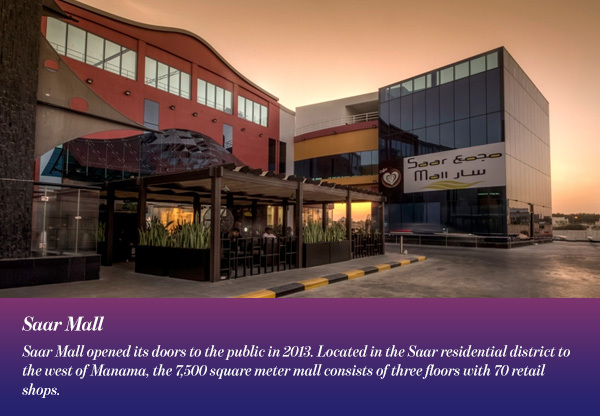 Located in Saar area to the west of Manama, the 7,500 square meter mall consists of three floors with 70 retail shops. Moreover, it also features restaurants, cafes, a Carrefour supermarket, and banks. In addition to an indoor play area, Big Game Zone, and a mini-cinema for kids. Saar Mall is a kid-friendly zone that boasts three separate regions revolving around family fun and entertainment. Finally, we come to the last entry on our list of the best malls in Bahrain, Dana Mall. 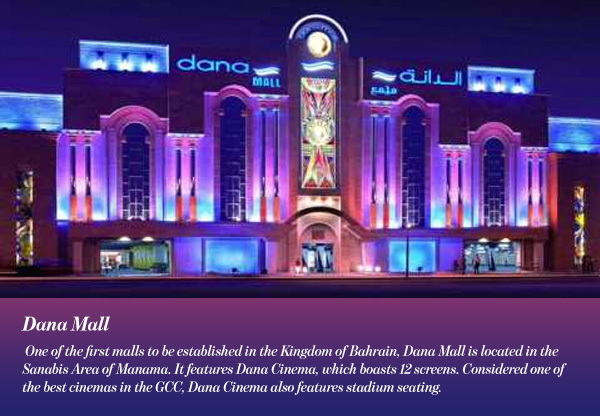 One of the first malls to be established in the Kingdom of Bahrain, Dana Mall is located in the Sanabis Area of Manama. It features Dana Cinema, which boasts 12 screens. Considered one of the best cinemas in the GCC, Dana Cinema also features stadium seating. Moreover, the mall includes a large food court, a Lulu Hypermarket, and many fashion shops and retail outlets.